How do I delete my Zoho account? I noticed that my subscription has been auto-renewed. However, I don't need it this month. Is it possible to cancel and get a refund? I created a survey in Zoho Survey. However, while logging on to Zoho, it says that my account is inactive. What would have gone wrong? I canceled my subscription by mistake. How can I revoke this? Can I get any discount as an Educator on upgrading to Premium Plan? Do you have an educational plan that would be useful for students or educators? I run a non-profit organization. Is there any discount in the plan that I qualify for? Can I use your Premium version to do a PowerPoint with the data? What should I do if my custom domain is not working? Where can I see a price comparison of your various plans? Could you provide more information about the white label solution for your surveys? Can I undo deleting an account? Is it possible to get access to the surveys that were created in the deleted account? Your subscription plan gets auto-renewed every month/year (depending on the option you gave while making the payment). Write to us at support@zohosurvey.com for any questions related to renewals and cancellations. 2. How do I delete my Zoho account? You can follow this link to delete your Zoho account. However, by doing this, your entire Zoho account will be deleted including all the service data, and this cannot be restored in future. You will also no longer have access to any of the Zoho products. 3. I noticed that my subscription has been auto-renewed. However, I don't need it this month. Is it possible to cancel and get a refund? The system auto-renews the subscription if we do not receive any emails regarding cancellation. If you do not wish to renew the plan, you can cancel your subscription and ask for a refund. We will process the refund for the auto-renewal of your survey account and it will be moved to the free plan. 4. How do I downgrade my plan? 1. 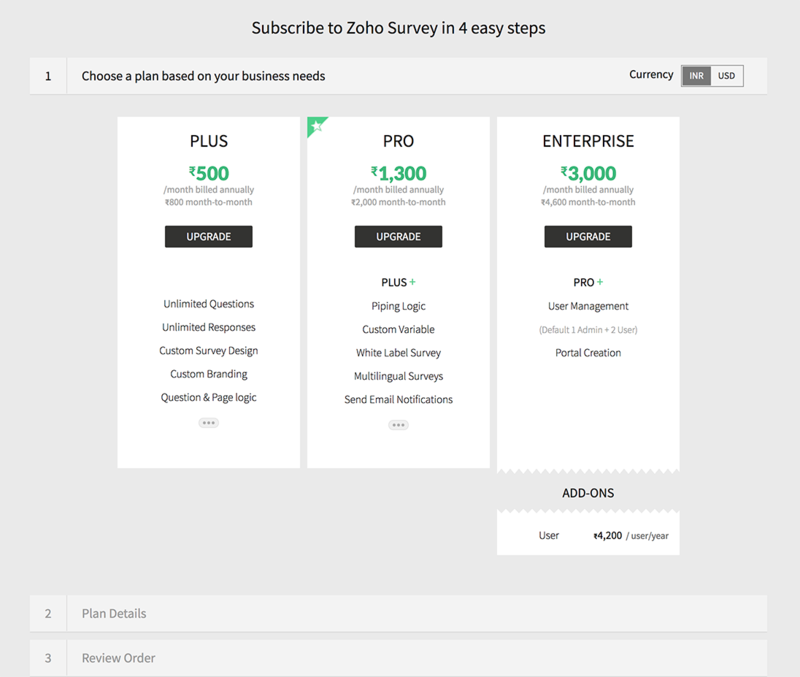 Click Subscription in the top-right corner on your Zoho Survey page. 2. Hover over the purchased plan and click Change Plan. 3. Click Downgrade in Free Plan. This moves the survey account to free plan with immediate effect. After downgrading, please write to us at support@zohosurvey.com and we will process the refund. Even after you get downgraded to the free plan, all your data will still be available and accessible, but with limited options. 5. I created a survey in Zoho Survey. However, while logging on to Zoho, it says that my account is inactive. What would have gone wrong? This may be because there is a lot of spam from certain domains and we do not allow disposable/temporary/masked email addresses to access Zoho Survey. These actions are taken to make sure our service is not being used for spam. Try signing up by providing a new email address that you know to be valid/proper. 6. I canceled my subscription by mistake. How can I revoke this? Write to us at support@zohosurvey.com and we will revoke the license. The survey subscription will get auto-renewed and you can continue accessing the surveys. 7. How do I upgrade my plan? 1. 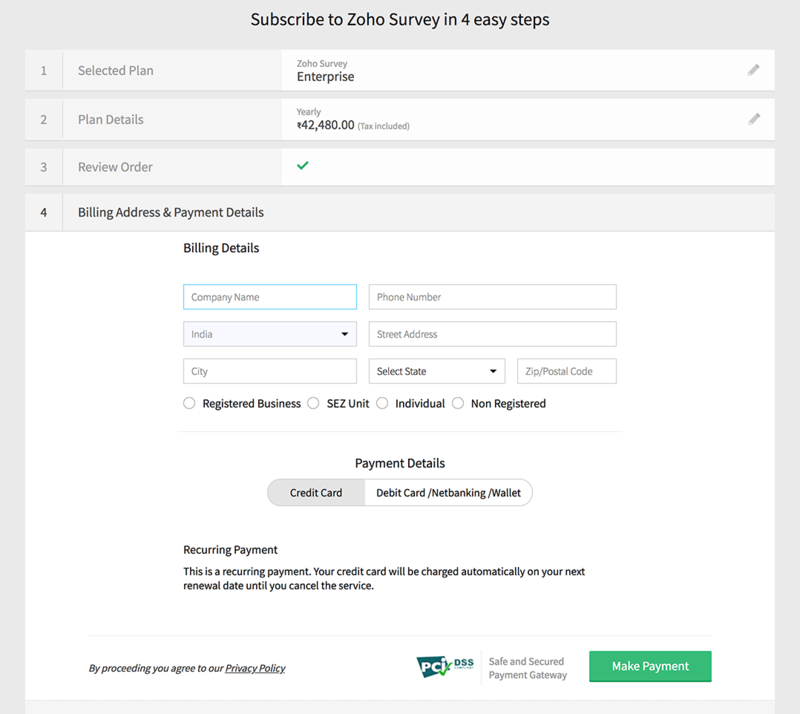 Click the top right corner of your Zoho Survey page and select Upgrade. 2. Take a look at our various plans and click Upgrade under the plan you wish to subscribe. 3. Click Monthly or Yearly in the Plan Details section, depending on your usage. 5. Review the plan details in the Review Order section and click Confirm. 6. Select the payment option in the Payment Details section and type in your payment details. 7. Add your address and select a billing address. 8. Select your business type. 9. Select the checkbox to agree to use the same payment details for your auto-renewals and other future transactions. 8. Can I get any discount as an Educator on upgrading to Premium Plan? You can submit a request at support@zohosurvey.com as an educator for free access and send us a scanned copy of your school/university identity card for verification. After verifying, we will enable the educational plan for you. 9. Do you have an educational plan that would be useful for students or educators? 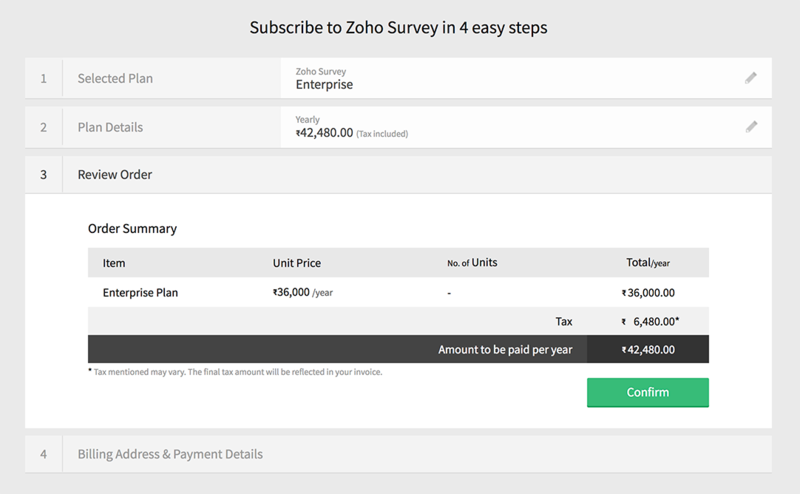 Write to us at support@zohosurvey.com with your institution or library's registered certificate so that we can have your Survey Standard plan activated for free on the basis of an educational discount. Click this link and sign up to activate your account. Remember to enter all your library details to have the license activated. 10. I run a non-profit organization. Is there any discount in the plan that I qualify for? 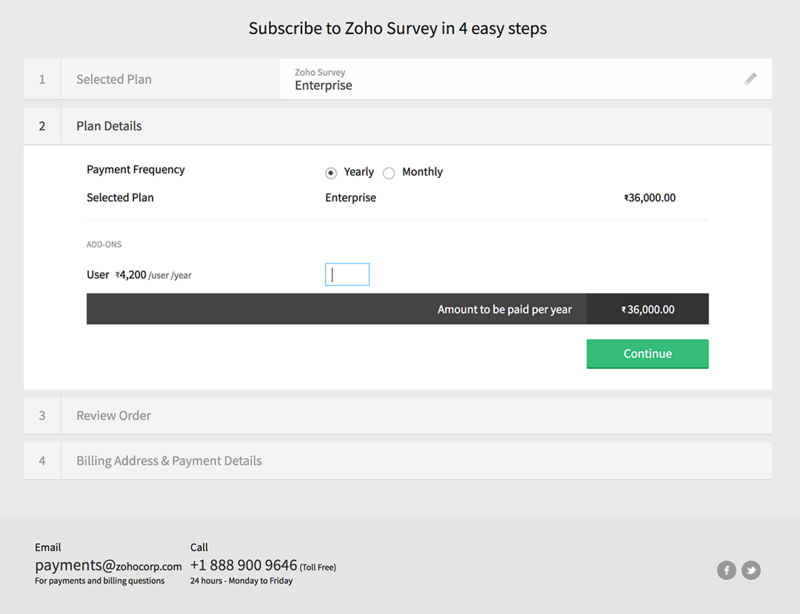 Write to us at support@zohosurvey.com with your organization's registered certificate so that we can have your Survey Standard plan activated for free on the basis of an NPO discount. 11. Can I use your Premium version to do a PowerPoint with the data? Sorry, Zoho Survey does not support exporting the data into a Microsoft PowerPoint format. Instead, you can consider exporting the data into PDF, CSV, or Google Spreadsheet. 12. What should I do if my custom domain is not working? 1. Sign in to your domain registrar's control panel. 2. Access the DNS Management Settings to change the DNS records. If you can't locate DNS Management, look for options such as Advanced Settings or Name Server Management. 3. Create a CNAME (or Canonical Name) entry from your sub-domain's admin portal. 4. Enter the host name and point it to customer-survey.zoho.eu. Changes to the DNS system are not immediate; it may take some time for them to take effect. 5. Contact Zoho Survey Support to purchase the SSL certificate for your sub-domain free of cost. SSL certificate will be renewed for the CNAME entry pointed during your initial purchase. SSL certificates purchased from third-party vendors cannot be installed in Zoho Survey. When the SSL certificate is purchased for your sub-domain, you can try accessing the custom domain link available in the Launch tab of your survey. Remember to make sure your website is live at the moment we try to access the survey link. 13. How do I set up a custom domain? 5. Contact Zoho Survey Support to purchase the SSL certificate for your sub-domain free of cost. SSL certificate will be renewed for the CNAME entry pointed during your initial purchase. SSL certificates purchased from third-party vendors cannot be installed in Zoho Survey. When the SSL certificate is purchased for your sub-domain, you can try accessing the custom domain link available in the Launch tab of your survey. Remember to make sure your website is live at the moment we try to access the survey link..
Read on custom domain setup in our help guide. 14. Where can I see a price comparison of your various plans? Check out our various plans and see what works best for your requirement. 15. Could you provide more information about the white label solution for your surveys? Log in to your Zoho Survey account, and click Setup. 1. Click Custom Domain on the left pane. 2. Type in your sub-domain name in the space provided. As Zoho Survey supports only sub-domain mapping, you'll need to add 'survey.' as a prefix to your sub-domain name. For example, if your domain name is Nike.com, then type in survey.Nike.com in the sub-domain name text box. 3. After this is done, create a CNAME entry from your sub-domain's admin portal. 4. Map your sub-domain to customer-survey.zoho.eu in the CNAME. 1. Sign in to your sub-domain registrar's control panel. 3. Create or edit a CNAME (or Canonical Name) record and point it to customer-survey.zoho.eu. If you are accessing Zoho Survey at survey.zoho.eu, point your CNAME to customer-survey.zoho.eu. The changes made to the DNS system will not reflect with immediately; it may take some time for them to take effect. Write to us (support@zohosurvey.com) to purchase a SSL certificate for your sub-domain after following the above procedure. SSL certificate will be purchased at free of cost. Please click here to read more. 16. Can I undo deleting an account? Is it possible to get access to the surveys that were created in the deleted account? The account, once deleted, cannot be restored. Instead, you can create a new account with the same credentials to access Zoho services. Unfortunately, it is not possible to restore the surveys from the deleted Zoho account.